Dear Càrn Mòr Society Members! Dear Friends of Scottish single malt Whiskies! 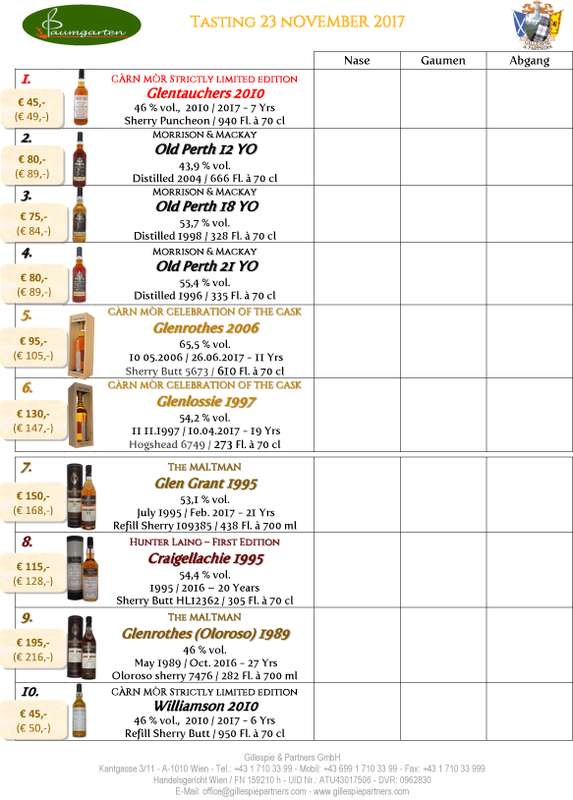 The last tasting for the current year, 10 Malt Whiskys, only single cask bottlings. The attendance fee for the tasting for Càrn Mòr Society Members and their friends will be incl. menu € 48.00 p. P.
Please note – a minimum number of guests of 25 is required, the maximum number is 35 guests. Please transfer the attendance fee of € 48,- to our account IBAN: AT02 2011 1300 0106 5720, account no. 300010-65720, with Erste Bank AG, BIC: GIBAATWWXXX, BLZ 20111, Recipient: Gillespie & Partners GmbH, Kantgasse 3, 1010 Wien, reason for payment „Name (John Sample) and „Tasting 23.11.2017“. In addition please book by e-mail to office@gillespiepartners.com.